With screaming sirens, the infamous diving Stuka set the standard for combined arms close air support operations. While techniques and technology have evolved to include attack helicopters, precision guided munitions and both fast and slow jets, close air support plays a critical role on the modern battlefield, enabling combatant commanders to change the tempo of an engagement. When the forces of Germany launched themselves over the borders of Poland in the opening days of the Second World War, the nature of combat was changed forever. The seamless integration of mechanised, armour, artillery, infantry and for the first time on a major scale, close air support units enabled the doctrine of Blitzkrieg to overwhelm successive opponents from Poland to France and the British Empire and highlighted the role air support would play in future conflicts. The power of close air support was not limited to land warfare, shifting to the naval domain, the power of fixed wing naval aviation became unquestionable following the Japanese sneak attack on Pearl Harbour and the routing of the Japanese Navy at the Battle of Midway. The post-war threat of the Red Army in Europe combined with technological developments enhanced the lethality and effectiveness of close air support. American and Soviet advances in helicopter technology resulting in the AH-1 Cobra and the Mi-24, combined with the advent of tactical fighter aircraft like the F-111, paved the way for the introduction of potent close air support platforms that were designed to dominate the Cold War battlefields of Europe and south-east Asia. However, the constant rate of technological evolution in both land and close air support platforms resulted in the modern pinnacle of close air support weapons systems, the A-10C Warthog, Su-25 Frogfoot, AH-64 Apache, evolved versions of the AH-1 Cobra, the Mi-28 and Australia's own Tiger Armed Reconnaissance Helicopters. Meanwhile, the advent of laser and GPS-guided precision munitions launched from stealth fighter bombers like the F-117 Nighthawk, which would devastate Saddam Hussein's Army during the first Gulf War, would pave the way for the large-scale introduction of such weapons into strategic bomber platforms like the B-52H Stratofortress and B-1B Lancer with devastating effectiveness in the Afghanistan and Iraq conflicts. Contemporary close air support operations incorporate a combination of 'high' and 'low' end platforms and capabilities designed to respond to the constantly evolving threats of the modern battlefield. The conflict in Vietnam was the first major conflict to leverage the tactical and strategic power of attack and lift helicopters. While still largely untested in combat, the advent of dedicated gunships in the form of the AH-1 Cobra and armed transport UH-1 Huey helicopters provided American and allied forces, including Australians, with rapid mobility and an unprecedented level of fire power. Vietnam's operational constraints, mainly the geography and the jungle, hindered the effectiveness of traditional fighter-based close air support, providing helicopters with the opportunity to cut their teeth. Additionally, Vietnam also saw the introduction of Forward Air Controllers (FACs) who were responsible for co-ordinating the strategic close air support provided by B-52s. As the US focus once again shifted to facing down the overwhelming might of the Red Army in Europe, the US began development of the AH-64 Apache, which would come to dominate battlefields across Europe, the Middle East and central Asia, with the unprecedented level of network interoperability, early-sensor fusion and leading-edge technology. Evolved versions of the Apache, and its European and Australian counterpart the Tiger, would again prove the operational importance of attack helicopters in the CAS role as the geographic confines of Afghanistan and the hard armour of Saddam Hussein's Army in Iraq would again present challenges to the limited number of fighter-based CAS aircraft. 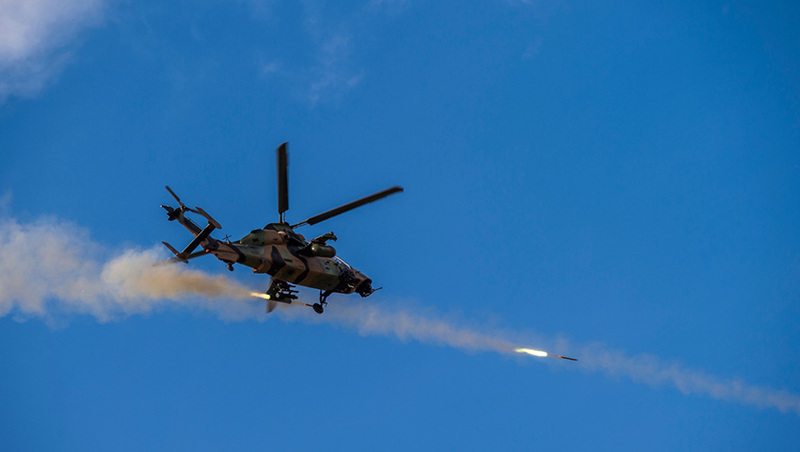 However, the increasing proliferation of cheap, reliable, often man portable anti-air weapons limits the effectiveness and survivability of attack helicopter platforms, paving the way for larger jet aircraft to fulfill the capability gaps. The A-10 Warthog is widely recognised as one of the most successful close air support aircraft in history, ranking behind only the Ju-87 Stuka, Il-2M and P-47 Thunderbolt for fame. The aircraft designed around a 30mm autocannon was designed to take on the brunt of the vast armoured corps of the Red Army during any conflict in Europe and would be responsible for slowing the advance until such time as US and NATO forces could be properly marshalled to counter the attack. While never used against the Soviet Army, the Warthog would establish itself, like its Apache counterparts, during the First Gulf War and would leverage the skills and doctrines developed by the FACs during the Vietnam War to devastate the Iraqi Army. These capabilities would be further enhanced throughout the late-1990s and into the 2000s through the introduction of precision guide munitions that would enable the Warthogs to actively work with ground forces within the confines of Afghanistan. Jets like the Warthog were not the only 'high' end capability utilised for CAS operations, the success of the B-52 during the Vietnam conflict, albeit indiscriminate success, paved the way for the introduction of precision guided munitions, similar to those first used by the F-117 Nighthawk and later the A-10 to devastating effect. However, these weapons would be integrated into the broader US strategic bomber fleet, including the supersonic, B-1B Lancer to great effect in Afghanistan and Iraq, and most recently as part of the coalition operations against the Islamic State in Syria. The shifting balance of power in the Indo-Pacific, combined with the increasing proliferation of anti-access/area denial (A2AD) systems by China have somewhat limited the role of CAS. However, the rapid development of long-range, stand off weapons systems like the Long Range Anti-Ship Missile (LRASM) capable of being deployed from land-based aircraft, including the strategic bombers and Australia's F/A-18F Super Hornets and carrier borne aircraft like the US Navy's F/A-18E/F Super Hornets, are serving to over come the challenges of A2AD systems. These factors, combined with the growing complexity of maritime based integrated air and missile defence systems from advanced cruiser, destroyer and frigate mounted radar systems, presents a number of challenges to these weapons systems and platforms. Accordingly, as defensive technologies typically favour the defender, close air support technologies and platforms will need to constantly evolve to provide the critical force multiplying capabilities needed to overcome increasingly complex integrated air defence systems.